The book on Florence street names sent me down a tangent researching the two types of stone you see commonly around Florence: pietraforte and pietra serena. Translated, the first is “strong rock” and the second “serene rock” – probably for its grayish color which lends a serene aspect where ever it is used. Both are types of sandstone. Pietraforte is often used outside because it is strong and resistant to the elements. Pietra serena is mostly used for architectural details outside and inside. There are exceptions of course, like the Uffizi uses quite a bit of pietra serena, structurally, outside. Pietraforte has a very characteristic, honey-brown color that works well in early morning or late afternoon light (when the sun is at an angle). 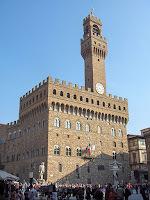 The most famous examples of buildings and structures using this stone are the Pitti Palace, Palazzo Vecchio, Ponte Vecchio, and Ponte Trinità to name a few. In Renaissance times, pietraforte came from a quarry ("cava") where the Boboli Garden is today. Via della Cava took you to the quarry, one can assume. Pietra serena as mentioned is grayish. 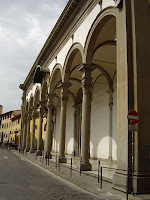 Examples outside include the Uffizi and in the pilasters of the loggia of Santissima Annuziata. In Renaissance times, pietra serena came from the Fiesole area. So pietra serena came from north of the Arno River and pietraforte from the south of the Arno. Today, this isn't true as new sources were discovered. Here is a technical paper that talks about these types of rock. Here is a tour (from a geological perspective) of Florence that talks about some of the building materials as well. There are a good examples of application of the "pietra serena", also in the modern architecture. Thanks for the link. There are some beautiful examples there.